Jess Gall b. 1994, based in Naarm (Melbourne). Approaches working through collaborative means with peers, practitioners and performers within her immediate community, as a means of collectively measuring how we fail or exceed within our own corporeal limits. Her practice addresses the dichotomy between production and presentation of performance as both imagery and event. Jess studied her BFA (hons) at RMIT. Her background in photography informs the development of an established cross-disciplinary approach to negotiating the current constraints of embodied performance practices, within institutional contexts, and the tension between visuality and presence. She is currently on a pursuit of disrupting dominant hierarchies of viewing, in order to critically shift the lenses through which performing bodies are comprehended. Jess has exhibited/performed at c3 contemporary arts space, Irene Rose Gallery, Blindside, TCB, Bus Projects, and 215 Albion. Jess acknowledges that she lives and works on the unceded sovereign land of the Wurundjeri people of the Kulin nation, and pays respect to elders past, present and emerging. 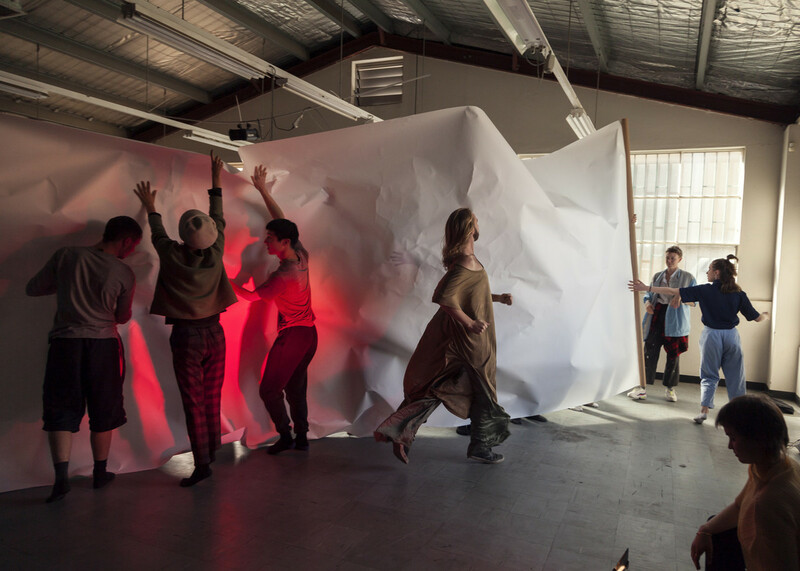 Arini Byng is an artist working with the affective qualities of materials, gestures and settings - undertaking exercises in image, movement and form to negotiate political scenes. Byng (born 1987) holds a B. Fine Art from NAS and B. Fine Art (Honours) from VCA. Her work has been exhibited across Australia including Blak Dot Gallery, 215 Albion, Irene Rose, c3 Contemporary Art Space, Hobiennale, Bus Projects, Slopes, Margaret Lawrence Gallery, Perimeter Presents, ACCA, and CCP; selected works published by Perimeter Editions, Higher Arc, Le Roy and Photofile; and with work held in publication collections of V&A, MoMA, MOCA, Tate Modern, MONA and NLA. Byng lives and works in Naarm (Melbourne) on the unceded sovereign land of the Wurundjeri people of the Kulin Nation. Rebecca Jensen is a dancer, choreographer and teacher. Her work embraces the specificity of dance and dancerly thinking as live, complex, change-oriented, multi-faceted and non linear. She holds a BA dance from VCA. She has presented her work in Dance Massive 2015/17, Venice Biennale International Dance Festival 2018, Kier Choreographic Award Finals 2016, Neon Parc To Do/To Make 2018, MPavillion Liquid Architecture 2018, Spring 1883 Windsor Hotel 2016, Next Wave Festival 2014/18, Supercell Festival 2017, Lucy Guerin Pieces for Small Spaces 2011. Rebecca collaborates with Sarah Aiken (OVERWORLD, Underworld, Airports and much more.) In the winter solstice of 2013 founded Deep Soulful Sweats (Tempo Festival Auckaland, Dark MOFO, FOLA, PICA Reckless Acts, Brisbane Festival, Santarcangelo Festival Italy, Next Wave Festival and Chunky Move.) Rebecca has appeared in works with and by Jo Lloyd, Lucy Guerin, Sandra Parker, Shelley Lasica, Lee Serle, Public Movement (Israel), Mårten Spångberg (Sweden), Atlanta Eke, Amos Gerdhart, Lilian Steiner. Notable collaborations include: Prue Stevenson, Nathan Gray, Natalie Abbott, Zoe Scoglio, Liz Dunn, Nathan Gray, Luke George. She was a recipient of DanceWEB scholarship Impulstanz Vienna 2015.